While the elegant architecture of the Bed and Breakfast resembles Mt. Vernon, it is the hospitality which makes it truly special. 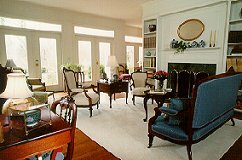 The main house has four guest rooms, and a two floor, two guest room suite in the wing. Tastefully decorated with distinctive touches, the Fairfax Suite offers a private sitting room on the first floor, vaulted ceiling in the upstairs guest room and Jacuzzi/bath. The cozy fireplace in the Stafford Room is perfect for the honeymoon couple or anyone in search of the ideal getaway. Situated on over 3 acres, the front courtyard, brick patio with fountain and gazebo in the back, all surrounded by gardens, make the outside as inviting as the inside. 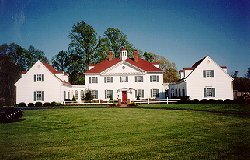 Located just north of Fredericksburg, Courthouse Road Bed & Breakfast is an easy drive from Washington, D.C. and Richmond, Virginia, and a perfect overnight or weekend escape from city life. This and other Stafford Bed and Breakfast Inns can be found here in The Register.